Rick Perry's Record on the Environment: Is it Bad, or Awful? In April 2009 the Environmental Protection Agency announced that it had found that carbon dioxide and several other greenhouse gases, though not pollutants in themselves, were subject to federal regulation under the Clean Air Act, because of the threats they pose to human health via climate change. It was not the sort of finding that Texas governor Rick Perry—long a skeptic, even outright denier, of anthropogenic climate change—was liable to welcome. Still, his response was even less measured than one might have expected: In February 2010, along with the state’s attorney general, he sued the EPA. Since then, several other states have followed Perry’s lead in challenging the EPA’s finding. As signaling devices go, suing the EPA is a pretty serious one, and Perry, who is now the frontrunner for the Republican presidential nomination, is serious about it. There are some respects in which his record as Texas governor has been more moderate than his critics suggest or fear, but the environment is not one of them. Throughout his career as a public official—which has spanned more than 25 years, including more than a decade now as governor—Perry’s record on the environment has seemed pretty unambiguous: He has come out against nearly all environmental regulations. That much is obvious, and it’s unlikely that (or, at least, unclear how) he would deny it. But Perry would also probably offer a justification for his record: namely, that he’s against those environmental regulations that he deems to have an adverse impact on the economy. That reasoning may sound tautological—a lot of environmental regulations are expensive, at least over the short term—but we shouldn’t be too quick to dismiss it, not least because it explains a number of deviations in his record. It’s unlikely that a President Perry would be a friend to environmentalists, but his opposition would be motivated by a calculus of political and economic utility, not by any abstract or ideological animosity toward their cause. PERRY'S CAMPAIGN AGAINST environmental regulation began more than twenty years ago, when he was running for agriculture commissioner, an office that naturally touches on a lot of stewardship issues. In 1990 the Democratic incumbent, Jim Hightower, had come under fire for his efforts to regulate pesticides; Perry, who was then a member of the Texas House and had recently switched from the Democratic Party to the Republican side, was one of the most vocal critics. Perry hadn’t been considered a strong contender for the job, but, partly due to the backing of Texas’s influential agriculture industry, he upset Hightower in what was one of his closest campaigns to date. As agriculture commissioner, Perry continued his fight for farming interests. Pesticides remained a bugbear. One of his early campaigns against the EPA came in 1994, when the agency was preparing to implement a revised Worker Protection Standard that requires more training and protective equipment; Perry complained that compliance was going to hurt farmers. He also parted ways with the EPA over the Endangered Species Act, which he argued prioritized birds and other animals over the livelihoods and property rights of Texas landowners. To the extent that there has been a consistent ideological thread running throughout Perry’s career it has been the idea that the federal government shouldn’t interfere with states’ rights. 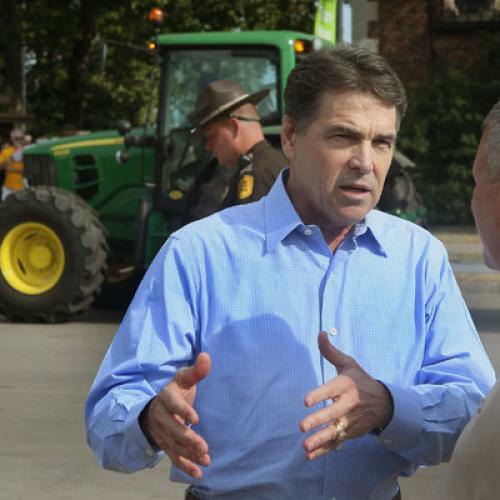 Perry has been open to some environmental regulations consistent with that principle. In 2001, for example, he signed a law that created a “flexible permitting” plan for pollutants. The scheme was meant to reduce air pollution, which had also been a stated goal of the Bush administration. In his current dispute with the EPA, Perry cites this measure as evidence that Texas is perfectly capable of reducing air pollution without the federal government forcing it to do so. It’s a bit of a non sequitur—the EPA finding is focused on the dangers of climate change, not smog. But in any case, Ken Kramer, the director of the Lone Star Chapter of the Sierra Club, argues that the reduction in air pollution in Texas has more to do with the ongoing implementation of the Clean Air Act than the flexible permitting scheme. Beyond that, Kramer adds, in 2005 Perry issued an executive order asking the state’s environmental agency to fast-track the permitting for a clutch of new coal-fired power plants. That same year, Perry also signed a law that would require Texas to derive 5,880 megawatts of electricity from renewable sources such as wind by 2015 (a figure that the state has already amply exceeded). It was a break from his usual rhetoric on mandates, but a measure that was supported by a coalition of environmentalists and, crucially, business interests. It sometimes surprises people who think of Texas as a traditional oil and gas state, but there is a sense among Texans of both parties that the state should generally be a leader on all types of energy. Renewables have broad support, including from conservative, rural west Texas, where much of the state’s wind generation takes place. As for the oil and gas industry, they have largely proceeded without interference from Perry, with one notable exception. Natural gas production, that is, has increased tremendously due to the technological innovation known as hydraulic fracturing or “fracking,” in which powerful slurries of water and other chemicals are pumped underground, breaking up rock formations and releasing the gas (and occasionally oil) trapped therein. This has given rise to concerns across the country—even in Texas—about the safety of nearby water supplies. Earlier this year, then, Perry signed a law mandating that companies disclose the chemicals they use in fracking—the first such measure in the nation, and one that was also welcomed by environmentalists and industry, as even the companies could see that people were getting upset about the practice. A comprehensive look at Perry’s record shows his environmental policy to be largely informed by economic interests. As president, he would be likely to scale back environmental regulations, or as campaign spokesman Mark Miner put it in an email to the Kate Galbraith of the Texas Tribune, “the EPA's intrusive, misguided and job-killing policies.” It also suggests, however, that Perry would support initiatives that help the economy and the environment, such as these vaunted “green jobs” that are often discussed in Washington and often spotted in Texas. As for the overarching question of climate change, Perry’s rhetoric suggests that he wants to make common cause with those Republicans who see climate science as a political phenomenon rather than a regular area of empirical inquiry. But we should keep in mind that here, as with many issues, Perry is willing to be flexible when confronted with political realities. In that, actually, he’s no different from most politicians. Last week, for example, Barack Obama outraged environmentalists when he ordered the EPA to not proceed with plans to require states to comply with more rigid ozone standards. The stricter standards had been planned since 2009, but as Obama suggested in a statement, the ongoing bad economy meant that he was unwilling to proceed with a measure that would have been costly for businesses to implement. It also might be the case that Obama was warily eyeing the prospect of facing a 2012 challenger who has been an outspoken critic of regulations in general and the EPA in particular. In any case, while environmentalists should rightly be critical of Perry, it’s possible that even the governor might be moved to support policies that would reduce greenhouse gas emissions if voters made it a priority, or if advocates could make the argument about energy security or long-term economic competitiveness. Pragmatically speaking, that may be the most effective line for environmentalists to take with a future President Perry. Though most of them are no doubt hoping that it won’t come to that. Erica Grieder is the southwest correspondent for The Economist, based in Austin, Texas.